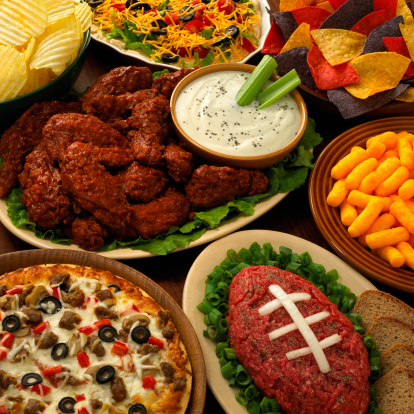 Super Bowl Sunday: pizza, wings, and (oh yeah) football! It’s that time of the year again where we all sit around the television and watch the Super Bowl Half Time Show! Oh, and there are a couple of men in tights throwing around a ball, too. This year, the San Francisco 49ers are playing the Baltimore Ravens in Super Bowl XLVII in New Orleans, Louisiana. Since its inception in 1967, the Ravens have only won once, while the 49ers have won 5 times. The Super Bowl can bring in over $150 million in revenue for the surrounding area. Not even the quarterbacks make that much money. Football fans will eat over 1.23 billion chicken wings. We’re glad that this does not reflect the number of wings that a single person will eat. Dominos Pizza will deliver an estimated 11 million pieces of pizza. And that’s just from one pizza delivery place! We wonder what that stat would be if they combined with other major pizza places like Pizza Hut, Papa John’s or Little Caesar’s. 48 million people will get takeout instead of cooking. Guess it’s going to be a fast-food frenzy! From these stats, it may be obvious that Super Bowl Sunday is the second highest day of food consumption—right behind Thanksgiving. That’s a lot of food! 9 out of 10 people will be watching the game at home or at a friend’s house this year. We want you to have fun, but you should be careful while driving home. If you have had too much to drink, call a cab. If you are hosting, make sure your buddies get home safely. Looking out for each other on Super Bowl Sunday will keep everyone safe.